There are purists in both tracking and trailing with exceptional backgrounds and knowledge in both respected fields. Be that as it may, I believe that police K-9 manhunts of the future will be ultimately based on training philosophies regarding trailing. Why might I take such a position? 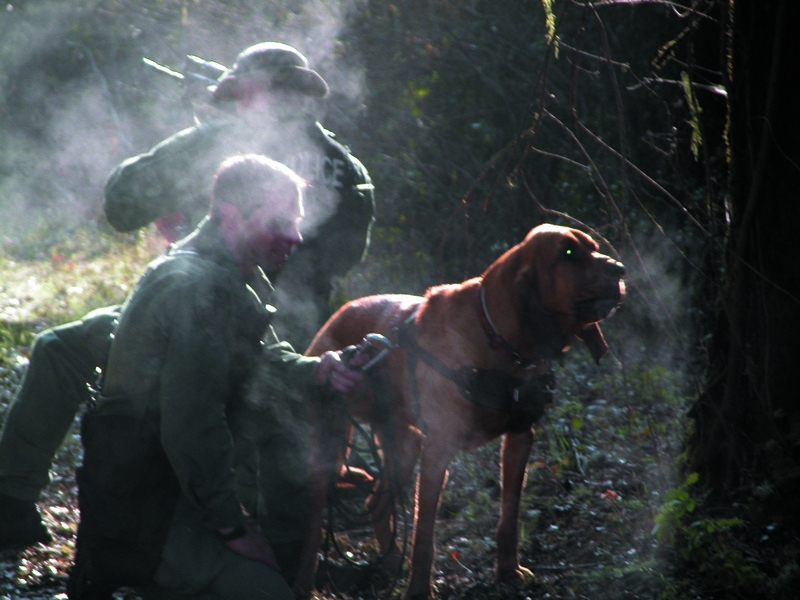 Simple—trailing is historically the much more effective method of locating humans with a K-9. There are many variations of “tracking,” but they all have a similar definition: the dog’s nose in the tracks made by a human on a soft surface. Once the paradigm shifts to that of a hard surface, such as an urban street, the ability of the police dog to follow now-invisible footsteps is almost erased. This is not because of the breed or the dog’s ability, but rather the nature of training to which the canine has been subjected. The theory behind tracking is generally twofold: 1) the footstep that caused the ground disturbance is the odor that the dogs follow, and/or 2) the footsteps are the location where human odor is most concentrated. It is easy to see why many early trainers felt this way. They trained on nothing but soft surfaces in relatively fresh conditions; thus, perception was reality—the dog’s nose hovered close to the actual track of the human. Consequently, training regimens were created to subscribe to the training philosophy. If the dog’s nose strayed from the prescribed height above the track, the dog’s nose was promptly forced back into it without anyone ever examining the reasons for the behavioral change to begin with. It was automatically presumed that the dog was outside of odor. Many people believe that the dog must be within inches of the track to actually smell the odor. I believe that this perception came from our own scent-limited world and false rationalization. Nothing could be further the truth, as simple tests have proven time and again that most dogs can detect odor from a fixed location and from a variety of distances—from inches to yards and more. You must simply ponder this one question: If it is proven that a dog can detect odor from either ground disturbance or from the human that created it, and from more than mere inches of the physical track, why must a dog’s nose be forced into said track? I equate this with forcing a dog to smell his own feces when he soils the carpet of the house; it is bad practice. Now let’s look at what happens to human scent when the paradigm shifts. Step from the freshly plowed field of the corn farmer to his gravel road right next door. Better yet, change the farmer’s gravel road to the highway. The track disappears, and it is now impossible to place the dog’s nose into it. With that being said, the hard-surface trail rarely pans out for the average police K-9. Trailing is a descriptive word for the art of allowing a dog to follow human scent wherever scent might be—on the ground or in the air. It can be taken one step further by adding scent discrimination to the equation. Each and every animal, human or otherwise, produces a distinctive odor based on species and other sub-determining factors. Unlike a tracking dog, a trailing dog is allowed more freedom of movement and, more important, a certain amount of independence. Independence in a police dog is normally considered an oxymoron; however, it is crucial to understand that scent is the dog’s world, and there is a very good possibility that the dog might have a better grasp on locating it than humans do. Our job as handlers is to simply interpret their actions and hang on accordingly. This does not mean that the dog is allowed to go about his business in any fashion he sees fit; rather, it is a partnership based on mutual understanding of limitations and individual ability. Excerpted and condensed from an article by Jeff Schettler in the appendix of his book, Red Dog Rising, published by Alpine Publications. This entry was posted in tracking dogs and tagged dog book, dog health, dog training, dogs, following human scent, K9 manhunts, man trailing dogs, police dog, scent discrimination, scent odor detection, tracking dogs, tracking vs. trailing dogs, trailing dogs. Bookmark the permalink.